Comic Coverage: The Highlight Reel: Who's Your Daddy? The Highlight Reel: Who's Your Daddy? Who better to celebrate Father's Day with than one of the "Big Daddies" of superhero comics: ODIN! Traditionally the chief god of ancient Norse mythology, Odin made the jump to modern mythology courtesy of Stan Lee and Jack Kirby's Thor series. Like all legendary patriarchs, Marvel's Odin was as wise and regal as he was remote and wrathful. Most of the time, Odin (and his inexhaustible supply of fabulous headgear) ruled from on high, leaving the messy clash of battle to his loyal subjects. However, once in a great while, Odin would set aside his fancy helmets, step down from his throne, and take matters into his own all-powerful hands. One such rare intervention took place over a span of three issues in Thor #143-145 (1967). Arriving from another dimension, a mysterious trio named the Enchanters sought to conquer Asgard and Earth using their "limitless power". 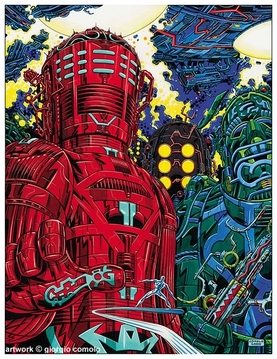 Possibly a foreshadowing of Kirby's Celestials, these eerie, elaborately-armored beings make quick work of Thor and his fellow Asgardians...drawing the attention and challenge of Odin himself! Patriarchs, have a Happy Father's Day!